According to how I’ve been taught, good crepes are judged upon how porous they are, how light they are and they have to have a great balance between all the ingredients. 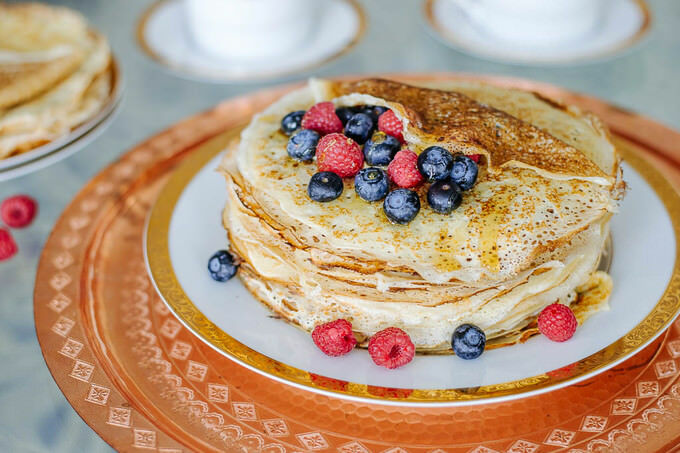 However, you should also keep in mind that there many variations of crepes. Regardless of how many different ones I try, I keep coming back to my tried and tested, porous crepe recipe. The balance is in the liquids, solids, and actives. Liquids are something you can actually play around with. But the batter consistency should not change much regardless the type of liquid you have at hand. It could be milk, buttermilk, (albeit diluted to create the right consistency) coconut milk, soy milk or even whey left over from either ricotta or farmer’s cheese. If you ask me, liquid whey makes the best crepes ever. They can be easily stuffed, folded and just eaten as is. Today I decided to use whey that I often have readily available after I make a batch of farmer’s cheese . I get a lot of questions about how to utilize it. Because people don’t just want to toss it away, they often look for ways to use whey (nice one, Lola!) This crepe recipe requires quite a bit of liquid to be used. If you have leftover whey, bring it on. If you don’t have whey, just substitute it with whole milk or low-fat milk. Both will work quite fine. 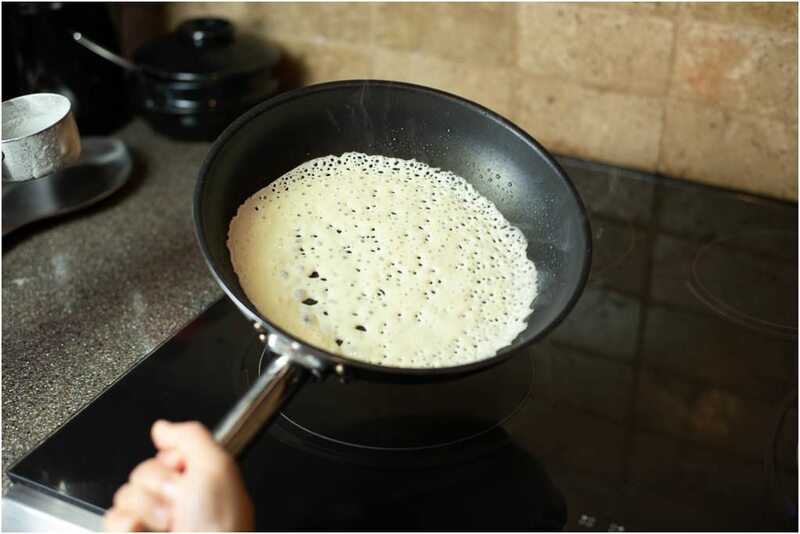 Another item you should have in your arsenal to make exceptional crepes is a crepe pan or a good non-stick pan. If you buy dedicated crepe pans, please do not use it for anything else. 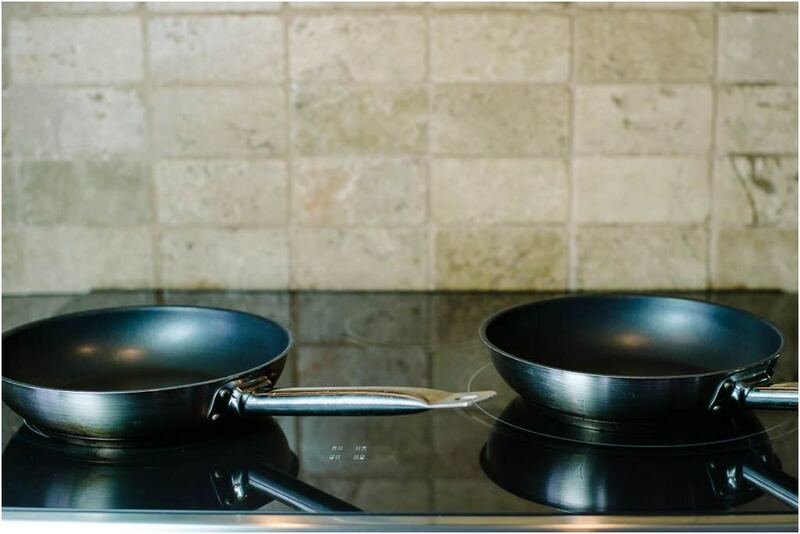 Or if you are using non-stick pans that are smaller in size, treat them well while you use them for other cooking purposes. No sharp objects, gentle washing, drying, seasoning, etc. 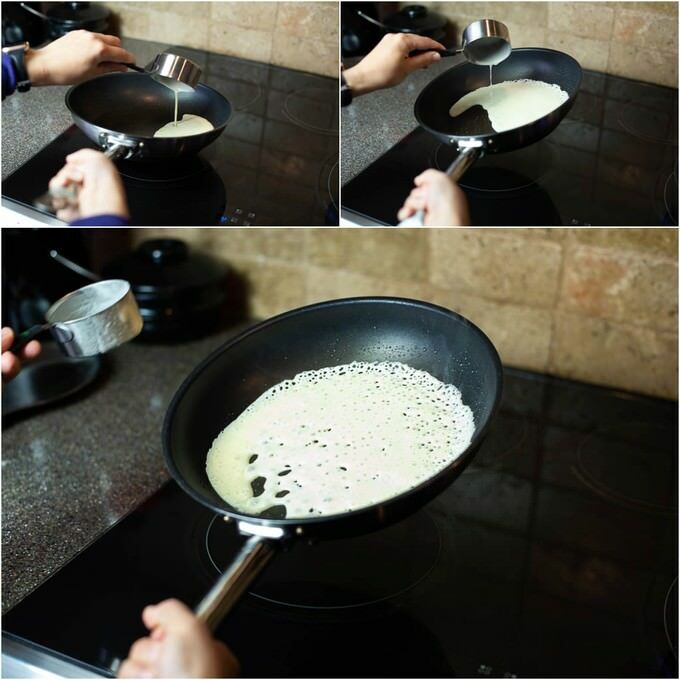 You can also use a cast iron skillet for cooking crepes. With proper maintenance, these skillets will serve you well. But they are so darn heavy to maneuver while spreading the crepe. The decision is yours to make, of course. Place the whey in a bowl that will hold twice they liquid’s size. 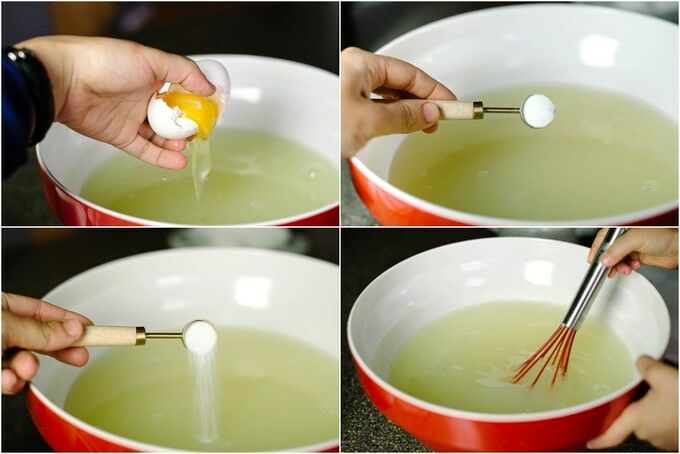 Crack 2 eggs, add the salt, baking powder, and the sugar. Give everything a nice mix. Add the flour. Start by adding 1 cup at a time. Incorporate that one cup well before you add another one. This will also help you determine if 2 cups will be enough. Keep that 1/2 to the side, just in case. I love incorporating flour with my whisk. But you are welcome to pulse the mixture in a blender or using a hand-held mixer. As long as you can have a mixture without any flour clumps, this mission is a success. For this recipe, I used exactly 2 and a half cups of flour. If you are using any other liquid than whey, you may need to use a little less. However much flour you decided on using, make sure the consistency of the batter is about the thickness of buttermilk. It is OK to have a slightly thicker batter verses a runny batter. 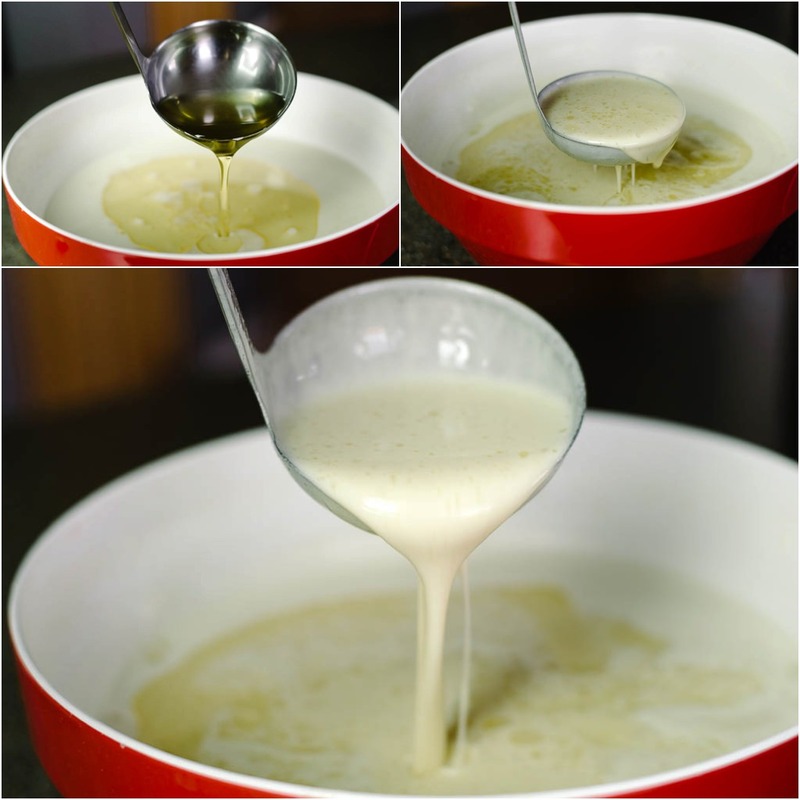 Add 1/2 cup of oil and incorporate it into the batter with the help of a ladle. Please do not use a mixer for this purpose. 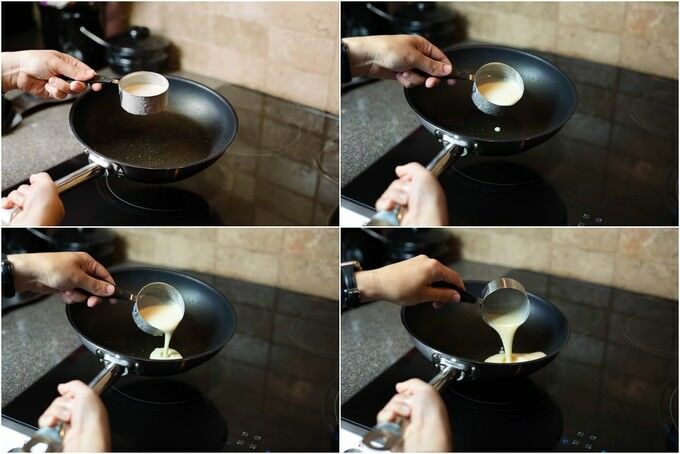 The idea is to create small enough oil pockets within the batter, by not dispersing oil too much. 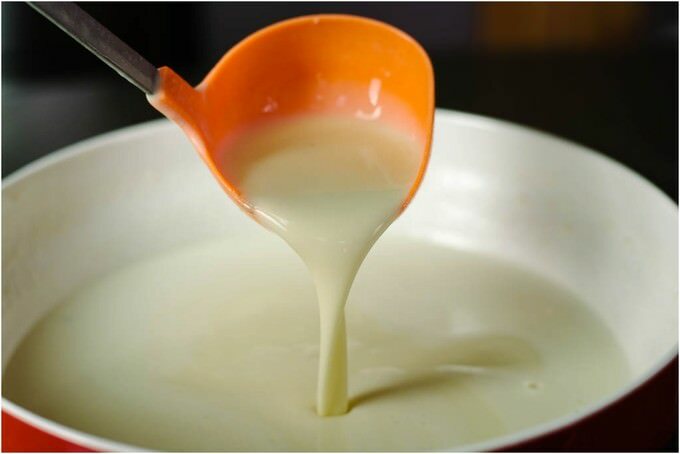 Repetitively fill the ladle with the batter and using the up and down motion mix the batter. At this point, the batter is ready to be cooked. I use 2 pans to cook the crepes. This way I can work twice as a fast and can make twice as many crepes. Start off with one pan until you get the hang of the cooking time and get accustomed to the temperature control. Initially turn the heat on to medium and heat up the pan. Add 1/4 of tsp oil. Using the brush generously grease the pan, covering the sides, too. Once you see the heat building up, the pan is ready to be used for the crepes. Look at the photos above and below carefully. For the size of the pans I have, I use a little less than 1/2 cup of batter to cover the bottom of the pan. The motion you are going to perform is going to resemble a circle. Pick up the hot pan and slowly start pouring the batter. Quickly rotate (circular motion) the pan, all the while continuing pouring the batter until the entire bottom of the pan is covered with the batter more or less evenly. The bottom of the pan is covered with a thin (ish) layer of the batter. Make sure it is not very thick. Since the pan is hot, as soon as the batter touches it you will see tiny pores forming. Place the pan back on the stove. You can increase the heat up a notch. So, if I was medium (5 in most electric cooktops), now I am going to increase the heat to 6. On heat 6 the crepes will cook very quickly. As in 30-60 seconds. I do not recommend you leave the sight of the kitchen until you are done with your batch. Trust me, you will be done in no time. Take a silicone spatula and slightly dislodge the sides of the crepes to help you flip them. 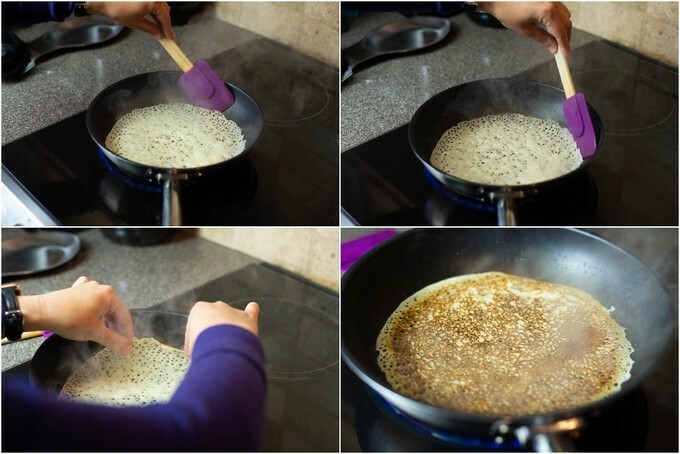 You can use the same spatula to flip the crepes. The other side of the crepes will be cooked very shortly, too. If you noticed that while you are flipping the crepes are ripping, you may need to turn the heat down a bit and let the crepes cook slightly bit longer. We are still talking about some extra seconds here. Keep a large plate next to your cooking surface and place cooked crepes on it. You do not need to de-grease the pans again. The oil inside the batter will be sufficient enough to keep you going until you are done with the entire batter. Et voila! Please do not get discouraged if something goes wrong. Most likely the problem will be in your pans or the cooking time. You can swap the pans, adjust the cooking time and keep on going. 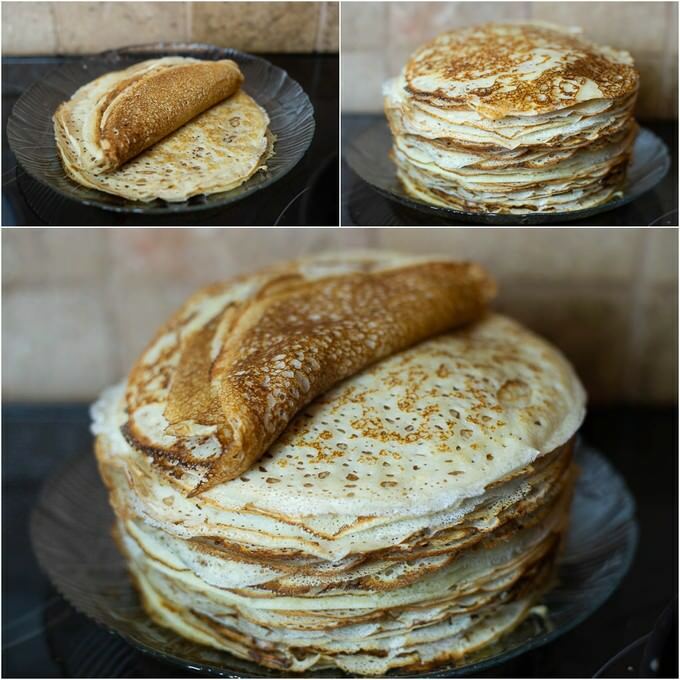 There is a saying in Russian that roughly means “First crepes come out in clumps”. I sincerely hope this recipe will prove the saying otherwise. However, if by any chance you encounter a problem, please leave a comment here or reach me through our Contact Us form so that I can help you out. You can stuff crepes with anything you like. we enjoy it with a savory meat filling, farmer’s cheese filling, jams, fruits and double creams. At times I like to spread some cream cheese and stuff them with smoked salmon. Delicious is an understatement. Let me know how yours turn out and I will see you around! However much flour you decided on using, make sure the consistency of the batter is about the thickness of buttermilk. It is OK to have slightly thicker batter verses a runny batter.